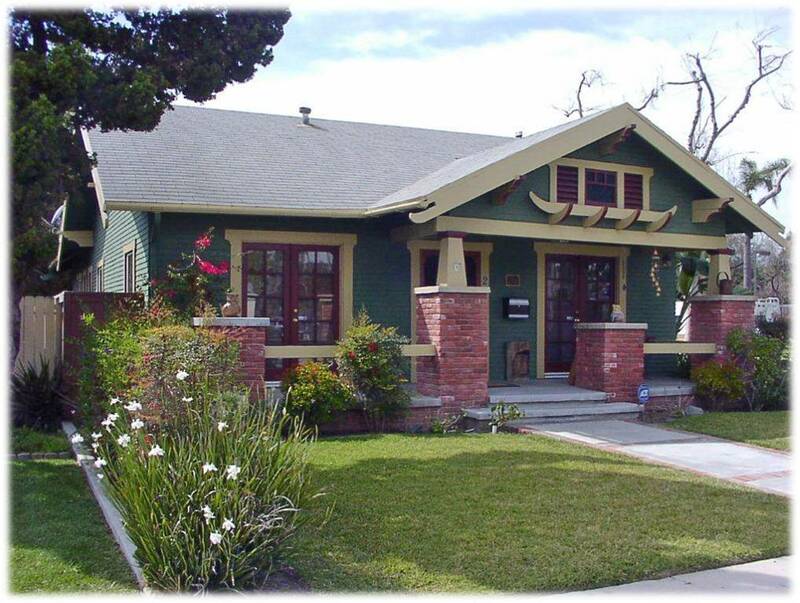 This remarkably preserved craftsman style home located on Ball Road between Walnut Street and Euclid Street was built by Sidney and Emma Holman in 1905 on a twenty acre citrus ranch known as the “Holman Place”. At that time, the Ranch was located “out in the country” surrounded by thousands of orange and lemon trees. Now the Holman House sits on a densely landscaped ¼ acre lot surrounded by the Wonderland Homes tract built in the mid-50’s. Peter and Linda Stewart have owned the home for over 35 years and have lovingly maintained and restored the home so that it retains the same look as it would have had over 100 years ago. 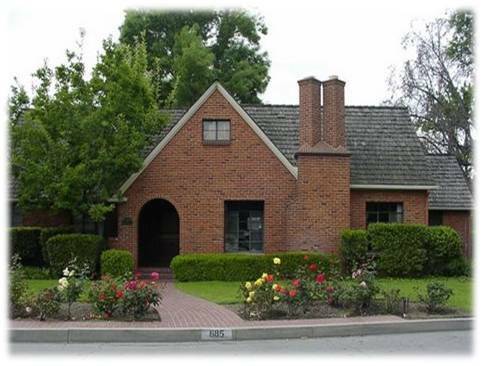 The Holman House was designated as a Historically Significant Structure by the Anaheim City Council in September 2011 and received a Mills Act designation in December 2011. It is one of a very small number of houses to have received this distinction outside the City’s four downtown historic districts. This clapboard and shingle home has a deep sweeping front porch covered by a large gable that extends along the entire front of the house. The base, steps and built-in porch planters are all made of poured concrete. The unique low railing around the perimeter of the porch consists of cast stone/molded concrete blocks stacked in checkerboard fashion. The multi-paned leaded glass windows, original door and period screen door reflect attention to detail of craftsmanship prominent in Anaheim’s surviving orange grove homes. Our featured home is nestled in one of Downtown Anaheim's latest created neighborhoods in the Anaheim Colony Historic District. This Queen Anne Victorian home, built in 1897 by John Rea (father of Kate and Ella Rea, for whom Katella Avenue was named) was originally located on the corner of Broadway and Philadelphia, and then moved to 125 W. Elm Street in 1922. This beautiful home was once again moved in 2007, and has been fully restored at 129 W. Stueckle Avenue. 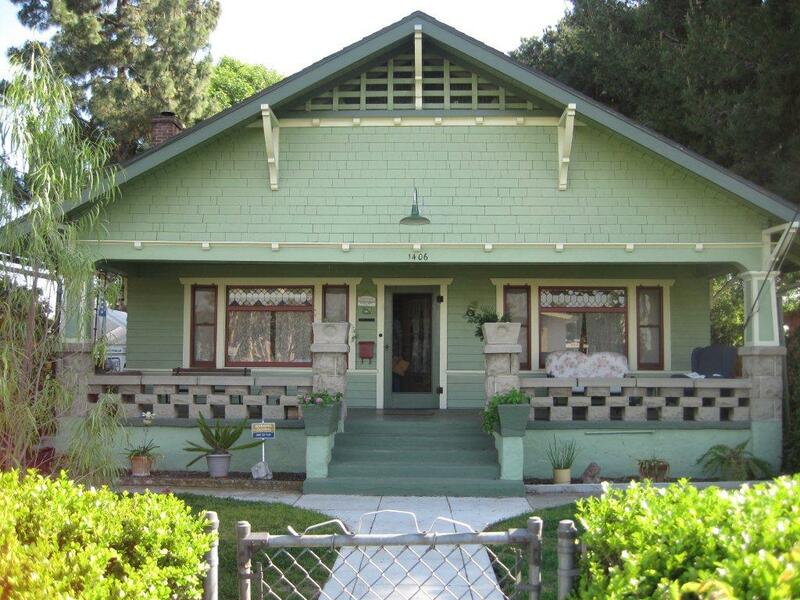 This rare architectural style and survivor of an early Anaheim era is a true gem to the community. This house was also home to former Anaheim Mayor, Louis Miller in 1928-1931. This unique red brick Tudor Revival style residence, located at 685 N. Helena Street, was built in 1952 by former Mayor Charles Pearson and his wife Sarah. Mr. Pearson was a notable member of the Anaheim City Council for 25 years, during which time he was mayor from 1940 to 1959. The Pearson residence features a multi-gabled shingle roof, a prominent stylized brick chimney and a meandering brick pathway leading to an arched entryway. This residence is one of 43 historic homes built between 1941 and 1955 within the Hoskins Historic District. The District, adopted by the City Council in 2008, is a prestigious neighborhood of rambling Ranch style and stately Colonial and Tudor Revival homes highlighted by beautifully landscaped expansive front yards. 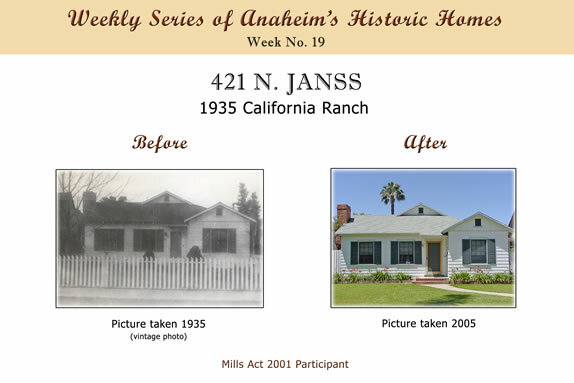 This collection of mid-twentieth century homes illustrates Anaheim life among the middle and upper middle class of that era. This single-story Craftsman style bungalow, built in 1912, sits prominently on a corner, directly across from Pearson Park. The home sits along a short block of wonderful residences that are best seen by a sidewalk stroll. Known as the Hilend House, this home, with its cross-gabled roof, brick columns and clapboard style redwood siding is accentuated by interesting Oriental influenced elements. Those features include the curving rafter tails and a unique set of four flared supports holding one long trim board with curved ends centered over the wide front porch. 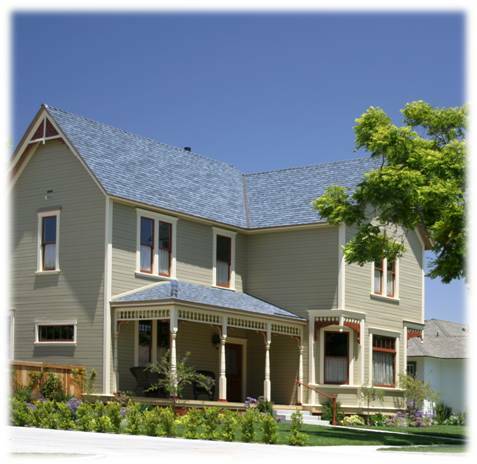 The rich colors selected for this home highlight the many trim features on the house, while allowing the siding to blend with the landscaping that complements the home. The lot that this house sits on was once owned by Clementina Zimmerman Schmidt who has been credited by historians with suggesting the name “Anaheim” which was eventually shortened and selected by a vote of the Los Angeles Vineyard Society members. James S. Hilend, a general contractor, eventually bought this lot and built the house. Over the course of the first 84 years of the life of this house, ownership had remained within two families, although several families had called it home over those years.